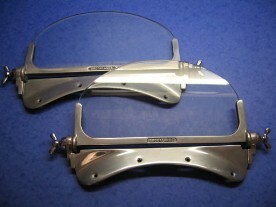 Vintage MG Parts supply plinth type aero screens, polished and ready to fit. Curved glass shown but we can also supply aero screens with the alternative rectangular glazing as shown below. 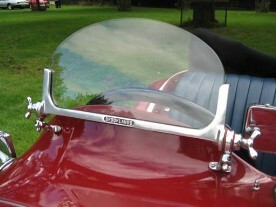 Please note that the plinth (skirt) type aero screens will not fit T Type scuttle tops. Excluding postage which is mandatory for this item, £15.60 UK delivery per package up to 10 kg; cost for overseas dependant upon volumetric weight and destination. Please note that we cannot combine postage for aeroscreens with any other parts in our catalogue.